With the year of organizing now into it's fourth month we've realized that there are definitely items that we really don't need anymore. I'm so happy that Kevin finally got rid of certain holy t-shirts but there is still a long way to go. 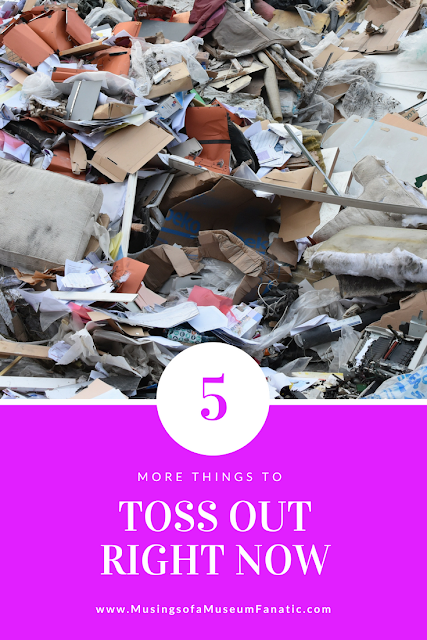 I've shared in the past 6 Items You Can Toss Right Now but there are definitely more that need to go on my and your list. Here are 5 more items that you can definitely toss out right now. You know the type. You get that free gift with purchase when stocking up on your favorite. They just sit there in your bathroom drawer taking up space and cluttering your life. Don't let them! Get rid of them. This might not be a clutter problem that everyone has but it's definitely one that I have. I have this handy leather business card holder, I think Dad gave it to me. Every now and then I go through it and purge. Last week I went through and realized I hadn't gone through it in over a year! There were some cards for people who are now in new jobs for almost a year. Even though they don't take up so much space don't let the ones you don't need or are too old stick around. In the past I've been the person who kept all the manuals and organized them with all of our other papers. Guess how many times I've ever actually read said manuals. Yup. Zero! If there is a warranty attached to one definitely save it until it expires but don't keep the manuals otherwise. I have found myself googling the manual more often then actually checking the physical file. 98% of the time I've found it too. We all have that one place that we used to love but never shop or eat there anymore because they burned us, we moved or some other reason. Yet that card still takes up residency in our bulging wallets. Why? Exactly toss them out. Better yet make sure to go online and unsubscribe to the rewards program and any related emails. No sense getting rid of the physical clutter and having the digital clutter still there. You'd think this would be a no brainer but I'm not gonna lie we're really kinda bad at this one. With our old phones I always want to take time and make sure everything is deleted and pulled off the phone. I say I'll get to it then the battery runs out and I can't find the charger for the old flip phone. It's bad! With the phone comes all the accessories. One time I found a charger, for a different flip phone, and realized that I had gotten rid of the phone months ago but not the charger! Take time right away to get rid of that stuff when you get a new phone. Better yet if your cell phone provider will buy it sell it to them and make some cash. Ditto on the manuals! I have so many that need to just get tossed out.